« Is It Worth Ruining Your Whole Day Over This? Step Off the Roller Coaster: The Drama Addiction. Today we ask that you look at your attraction to drama. Humans love drama. It is, of course, one of your greatest art forms and modes of expression. Stories, mythology, fiction, drama played out on the stage and screen, “reality TV,” tabloid drama, video game drama — humans never tire of drama. Mainly when people speak to one another, they speak in terms of their dramas. Their problems, their conflicts. They gossip about other people, speculating on dramas in the lives of others, which may or may not be true at all. Every situation in the stuff of drama. Every decision is a potential drama. Even the simplest choices can create dramatic conflict: “Which phone should I buy?” “Which airline ticket should I purchase?” People agonize over such decisions. With drama arises tension, and stress. All dramas involve stakes. The stakes may be high, or low — but the physical body has difficulty differentiating between high stakes and low stakes dramas. And herein lies a great problem. The physical body cannot easily differentiate between a “high stakes” and “low stakes” drama. While the characters in movies may be facing life or death scenarios with flying bullets, you may experience a pulse-pounding internal drama sitting in a traffic jam, or talking to a customer service representative on the phone. This is not good for you. Ultimately, too much pulse-pounding drama has a way of wearing down your nervous system, your endocrine system, your cardiovascular system, your digestive system, your immune system — basically, every bodily system is compromised by excessive drama. Point being, drama is something that humans need to experience in limited doses. Too much is not good for you. Many of you have visited amusement parks with roller coasters. When you go on a roller coaster, you choose to experience a pulse-pounding, physically stressful situation. You do it because it’s fun, and mildly addictive. And there is nothing wrong with enjoying a roller coaster ride. But imagine what would happen to you if you went on roller coasters every single day. Just imagine what would happen to your body if you went on roller coasters all day long, for weeks on end. You would experience nervous exhaustion, adrenal collapse, and all manner of unpleasant physical symptoms. You might have chronic anxiety, insomnia, and even PTSD. Your immune system could break down. You might experience heart problems. 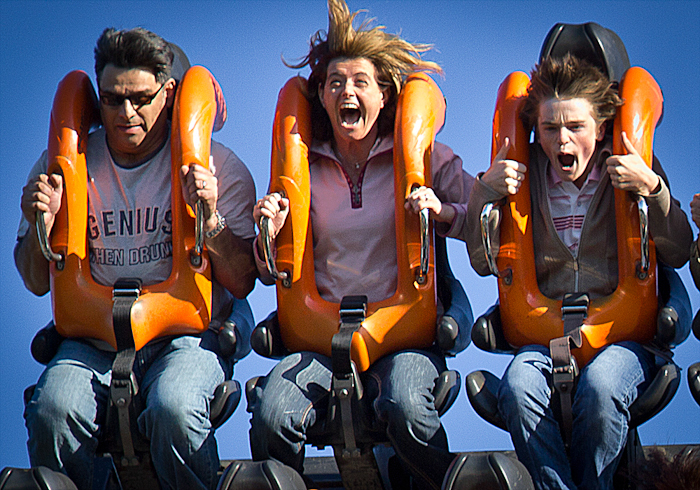 Moreover, you would no longer find the experience of riding a roller coaster pleasurable. It would start to feel like torture. This is a fairly good analogy for what many humans do to themselves. Only instead of going to the roller coaster park every day, they commute to work. They experience pulse-pounding dramas over responding to emails and talking to the boss and picking the kids up from school. Then they cap off a dramatic day by watching the news and fictional dramas before going to sleep. Naturally, they do not sleep well. At least roller coasters can be fun. But most people are not having much fun in their drama-addicted lives. Please start to observe your own addiction to drama. Notice when you find yourself in a “pulse-pounding” situation. Notice how often this happens, in a day. Make it your intention to decrease the amount of drama you experience in daily life. What does an undramatic life feel like? It is a life in which you make a real effort not to get unnecessarily worked up over little things. When you notice yourself getting very dramatic about something, you make a real effort to step away from the situation, so that your body and emotions can calm down. You make a real effort to lower your pulse, instead of raise it. Also, if you are experiencing a heavy dose of general life drama, work to eliminate additional sources of drama. When you are stressed out, that means it is time to unplug from the internet, step away from the news, and forego watching those pulse-pounding TV shows. The world will not end if you do this. Instead, choose to do things like meditation, restorative yoga, going for a walk, listening to music, taking a bath, or cuddling with an animal. This will give your body some drama-free time to unwind. Drama is like chocolate, or wine. A little bit can be most enjoyable, and add spice to the life experience. But too much will make you very sick. Most humans are consuming amounts of drama that are far beyond tolerance level. So just notice all the ways in which you amp up the drama in your life, including watching the news, or a tension-inducing drama on TV after a stressful day. Imagine that constantly living in drama is like going to the roller coaster park every single day, in terms of wear and tear on the body. Choose to decrease the drama in your life. This will not make your life boring. It will actually make the drama you do experience more enjoyable. Going to the roller coaster park once in a while can be fun. Going every day is torture. Drama is like chocolate. A little bit is pleasant. Too much will make you sick.